Raksha Bandhan celebrations include various rituals and customs without which the celebration of Raksha Bandhan is incomplete. Raksha Bandhan celebrates the love of brother and sister. Raksha Bandhan means “bond of protection” and the day starts with tying of Rakhi on brother's wrist by his sister then the day is followed by a prayer and then a family feast. 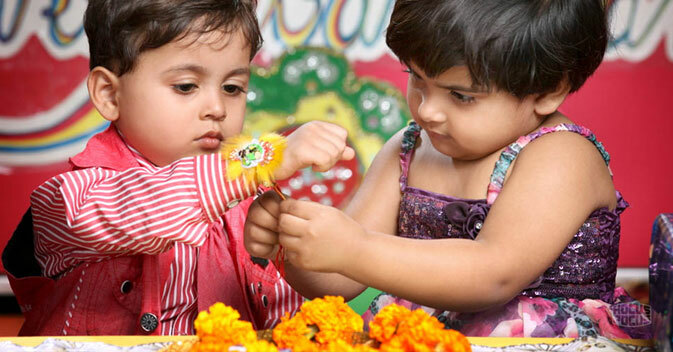 The beauty of Raksha Bandhan celebrations lies in its ritual of tying Rakhi. Rakhi is a sacred thread that carries a deeper meaning of love between bother and sister. The excitement of Raksha Bandhan celebration starts a day before the celebration. Planning is done for family get together as the family feast is organized. Sisters who are staying away send Rakhi to their brothers. The day of Raksha Bandhan is of great importance in the life of Indians. The spirit of Raksha Bandhan celebrations could be seen everywhere. Even the markets get into a festive look as every stall is flooded with beautiful Rakhis and spectacular Raksha Bandhan gifts. The ritual and Traditions & Customs of Raksha Bandhan celebrations are very old and various stories in Indian history and Hindu mythology are associated with the Origin of Raksha Bandhan. The day is not only a celebration for brothers and sisters but it is also a celebration for the entire family. Brothers and sisters also exchange gifts on this day and the blessings of entire family are bestowed on both brothers and sisters. Indians residing in other countries never forget to celebrate Raksha Bandhan. According to Hindu calendar, Raksha Bandhan falls on the month of Shravana (August). It is said that Raksha Bandhan celebrations are followed since Vedic times. The day marks emotional bonding between brothers and sisters. It is one of the important festivals of India and people all over the country celebrate the festival of Rakhi in a traditional Indian way.